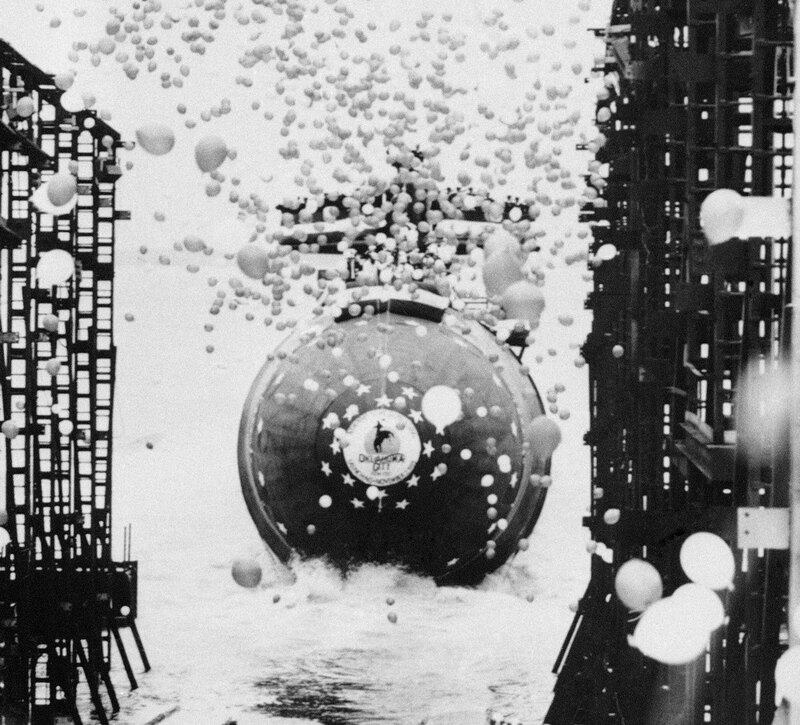 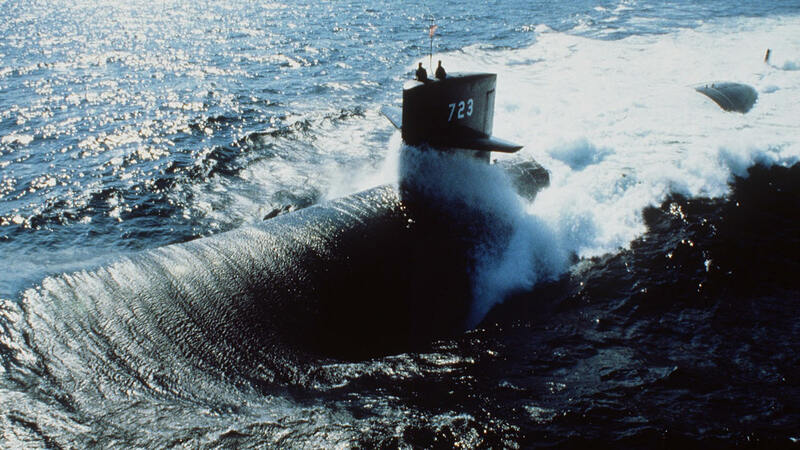 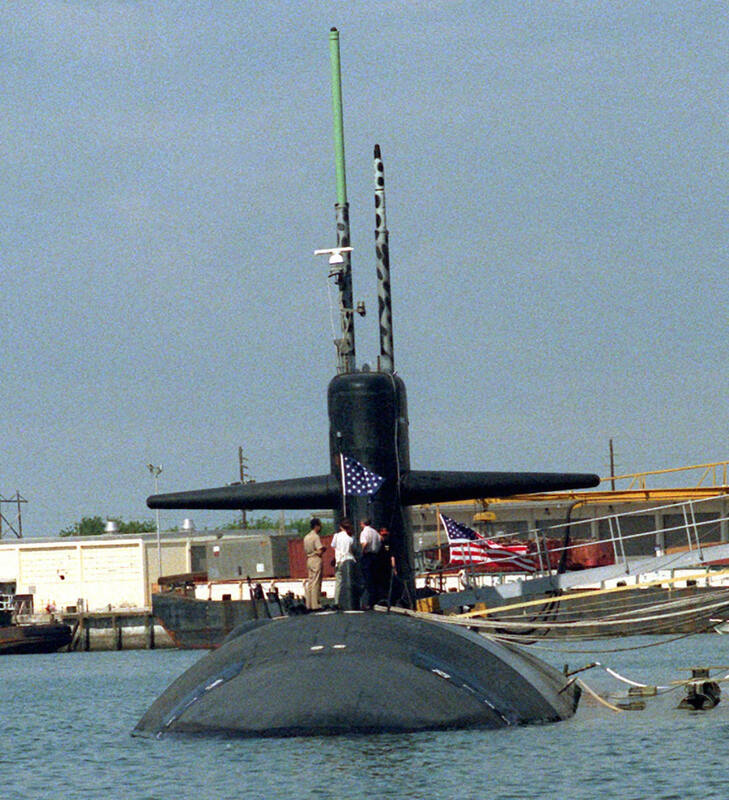 The second Oklahoma City (SSN-723) was laid down on 4 January 1984 at Newport News, Va., by Newport News Shipbuilding & Dry Dock Co.; launched on 2 November 1985; sponsored by Mrs. Linda L. M. Nickles, wife of Senator Donald L. Nickles, Okla.; and commissioned on 9 July 1988 at Naval Station (NS) Norfolk, Va., Cmdr. 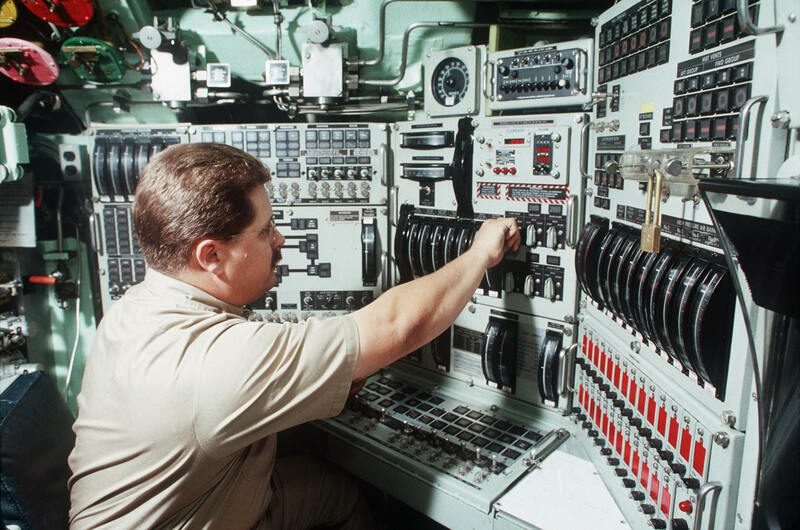 Kevin J. Reardon in command. 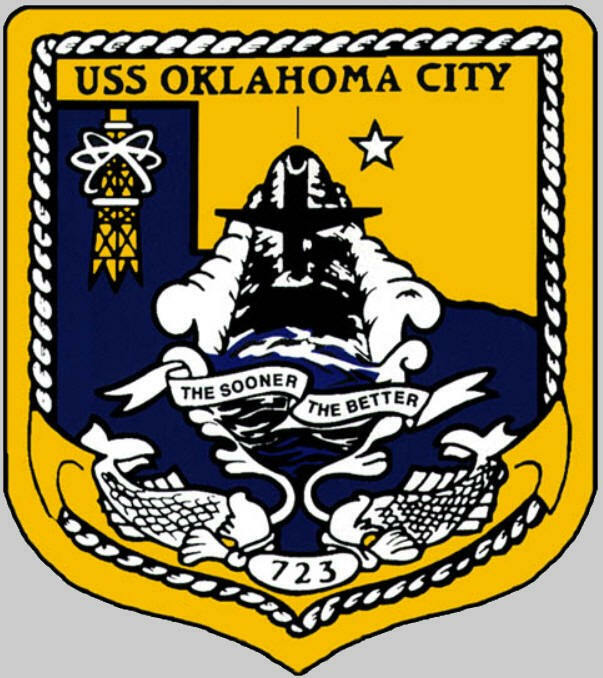 Oklahoma City, Cmdr. 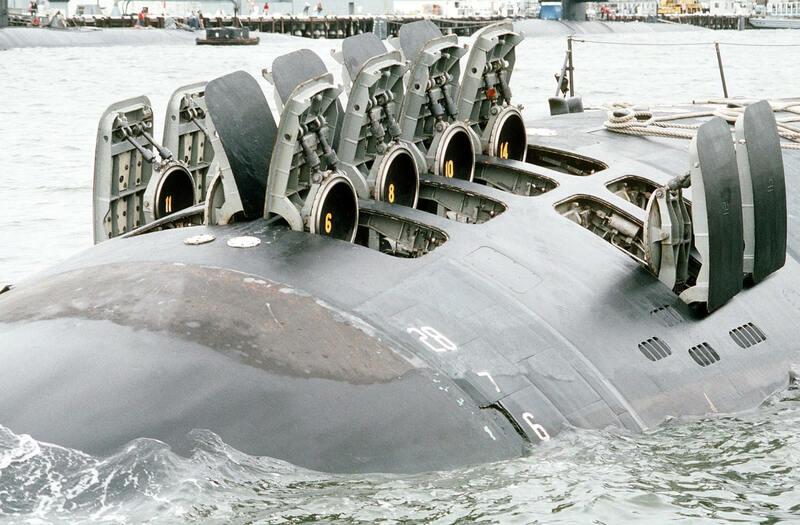 Richard C. Voter in command, and Norman Lady, a liquefied natural gas tanker registered with Leif Höegh & Co., en route to Trinidad, collided just east of the Strait of Gibraltar while the submarine surfaced while sailing from Italian waters for the United States at about 1330 on 13 November 2002. 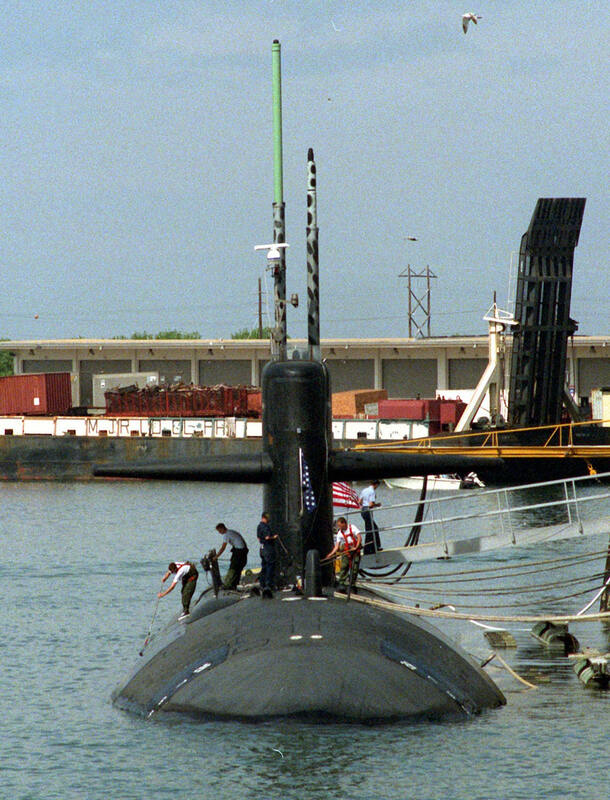 The impact damaged Oklahoma City’s sail, though neither vessel reported any casualties. 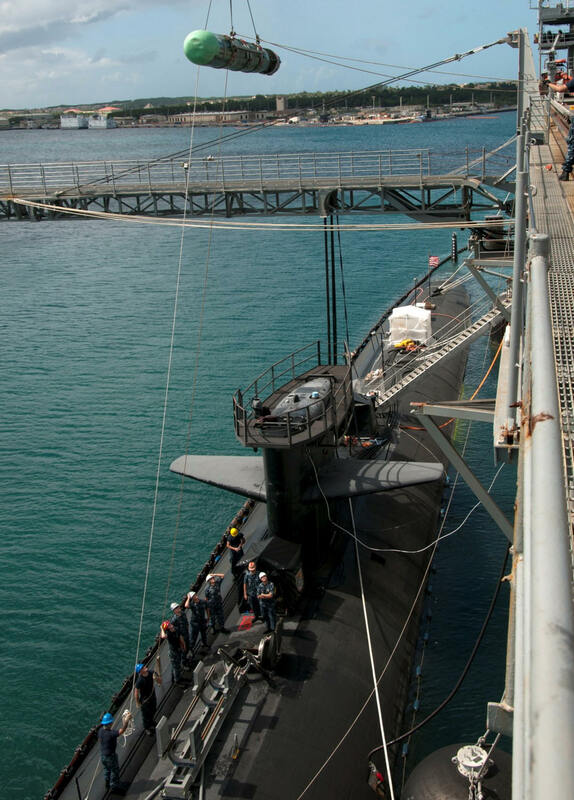 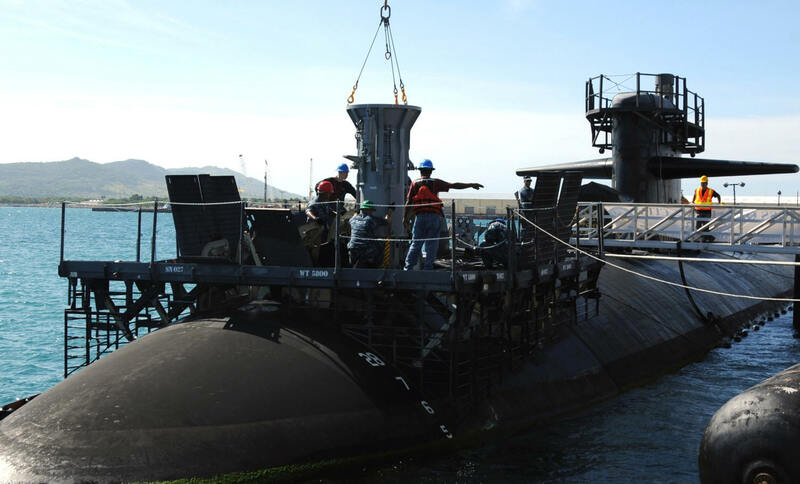 The attack submarine completed repairs at La Madallena, Italy. 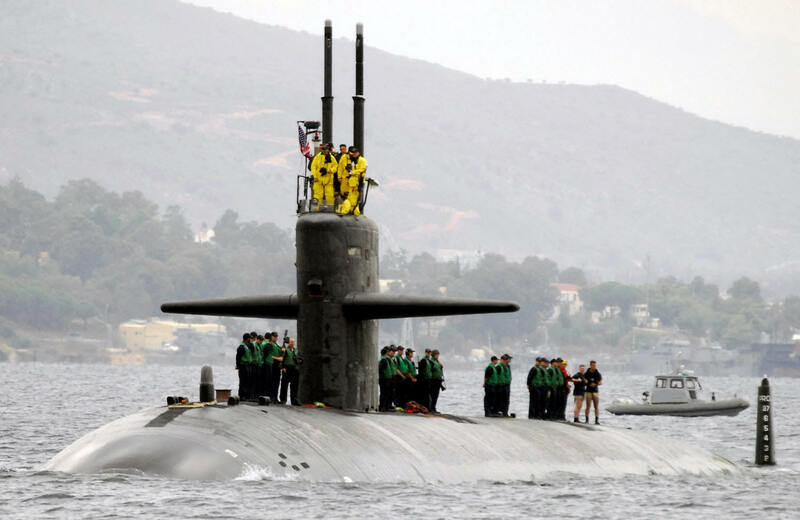 Rear Adm. Kirkland H. Donald, Commander Submarine Group 8, relieved Cmdr. 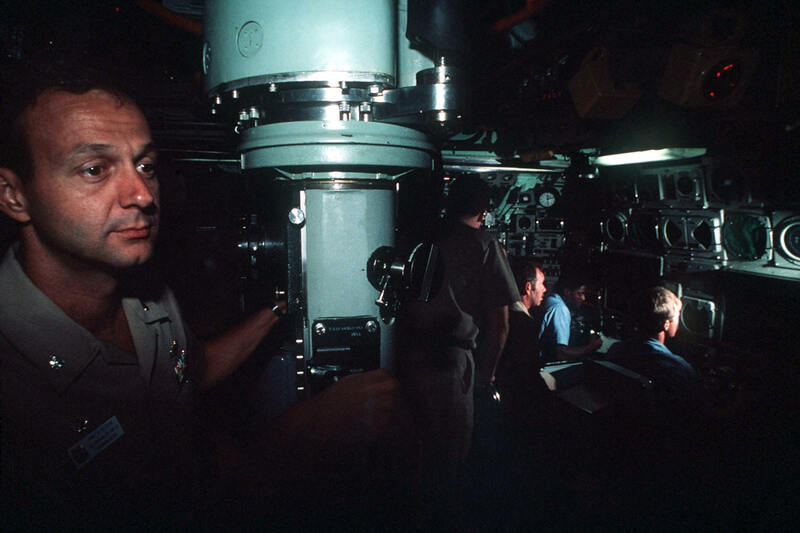 Voter of his command on 29 November, and Capt. 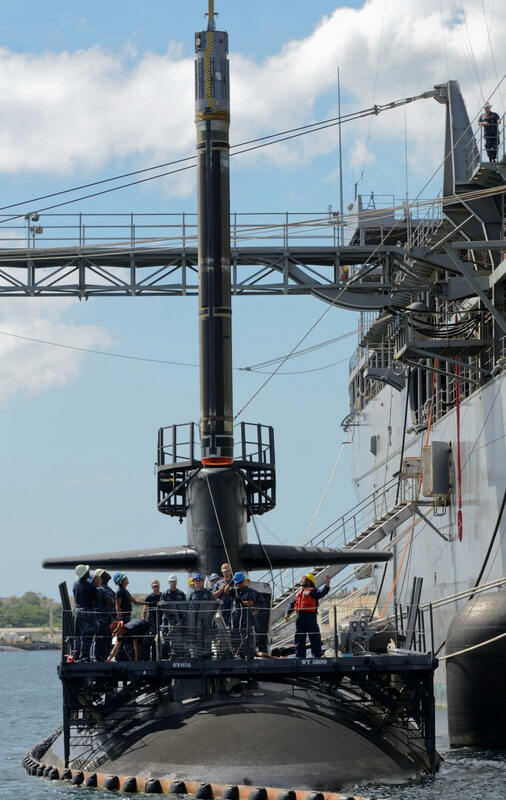 Howard F. Reese, Commander Submarine Squadron 22, assumed command until Cmdr. 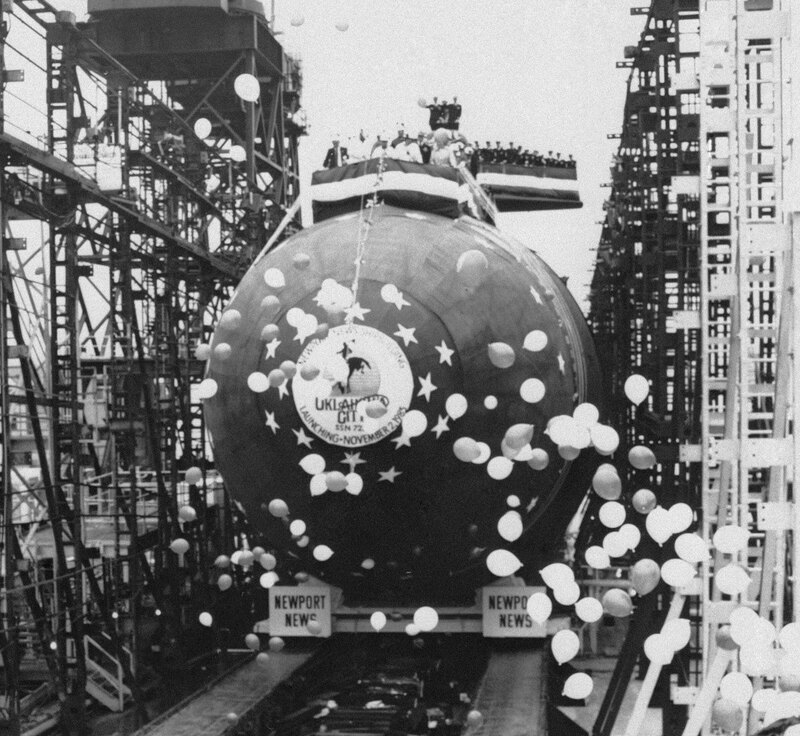 Ronald A. LaSalvia relieved Reese on 3 December. 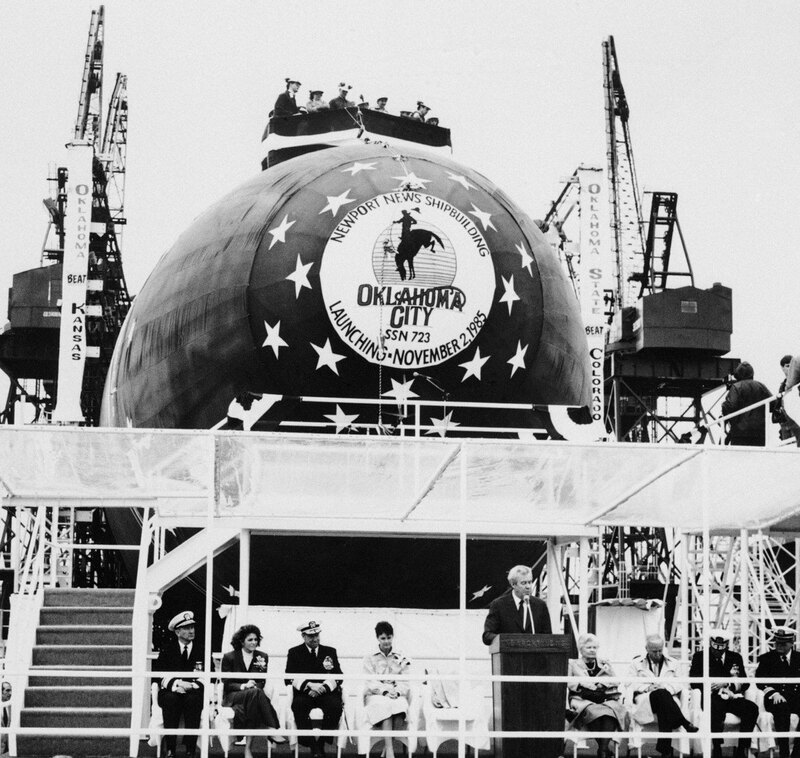 Two days later, Oklahoma City resumed her voyage, returning to Norfolk on 18 December and in time for Christmas. 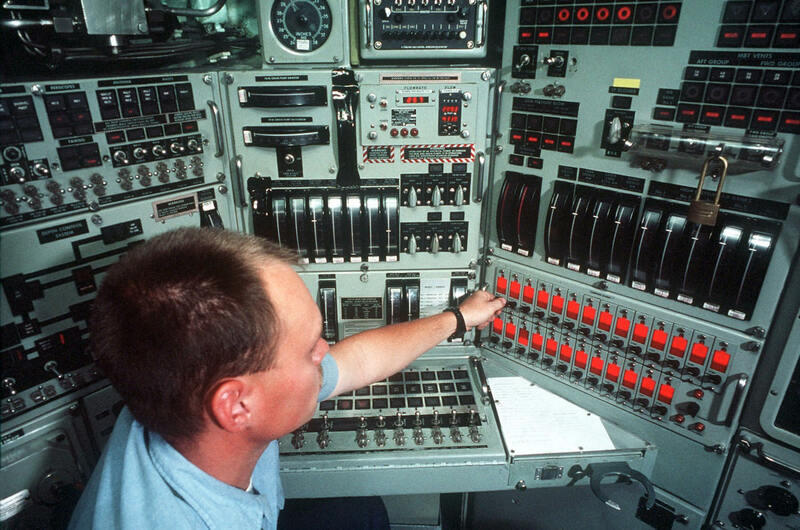 The Voyage Management System (VMS), a combination of digital charts, constant global positioning system fixes, environmental sensors, and electronic command and control, was installed in Oklahoma City during 2007. 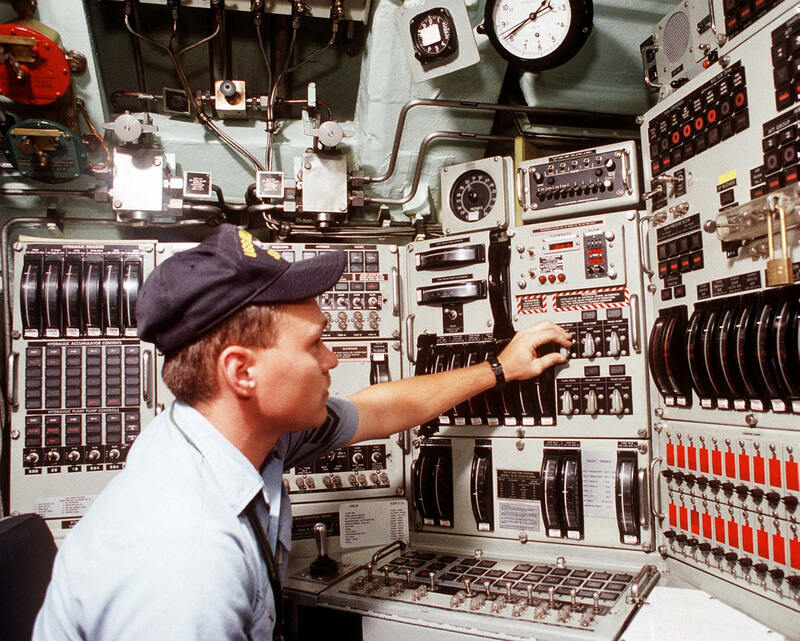 The VMS streamlined the boat’s navigation and saved space by replacing the paper charts with electronic scans on compact discs. 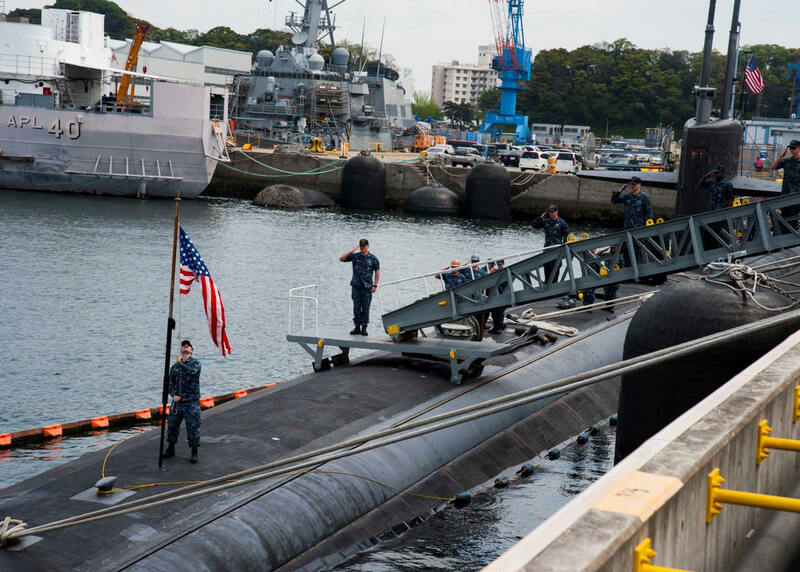 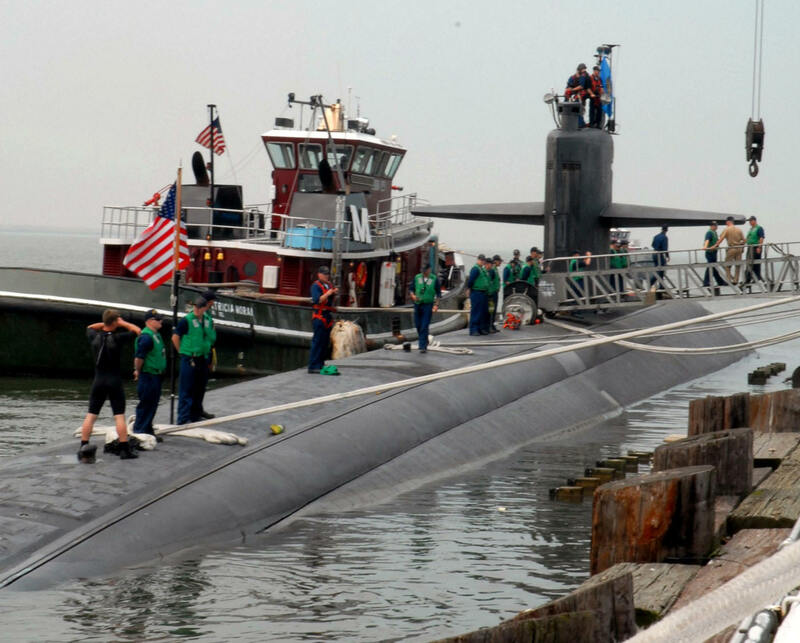 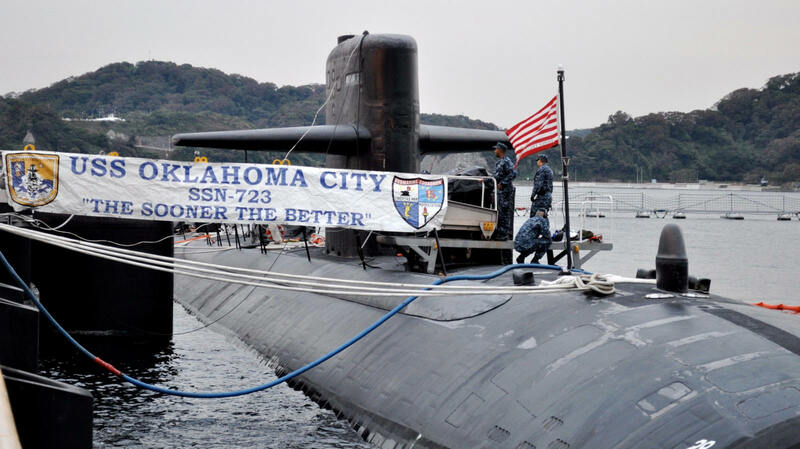 Oklahoma City forward deployed to Naval Base Guam, reaching the island on 3 March 2011, where she subsequently relieved attack submarine City of Corpus Christi (SSN-705) - which shifted to Joint Base Pearl Harbor-Hickam, Hawaii. 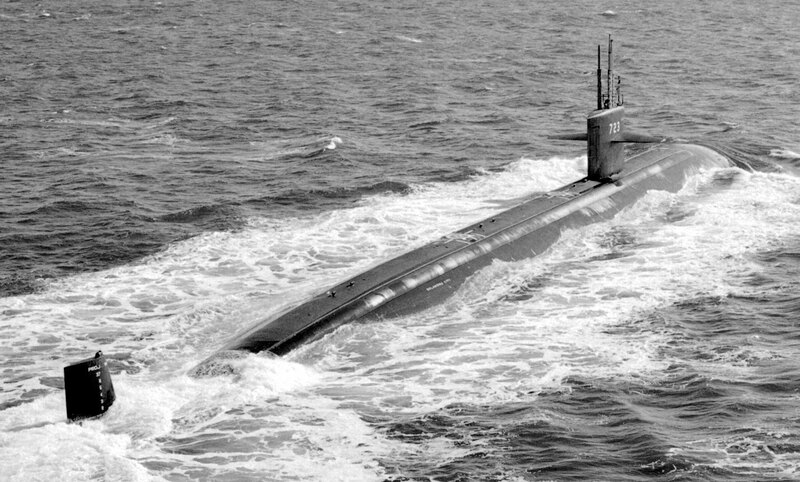 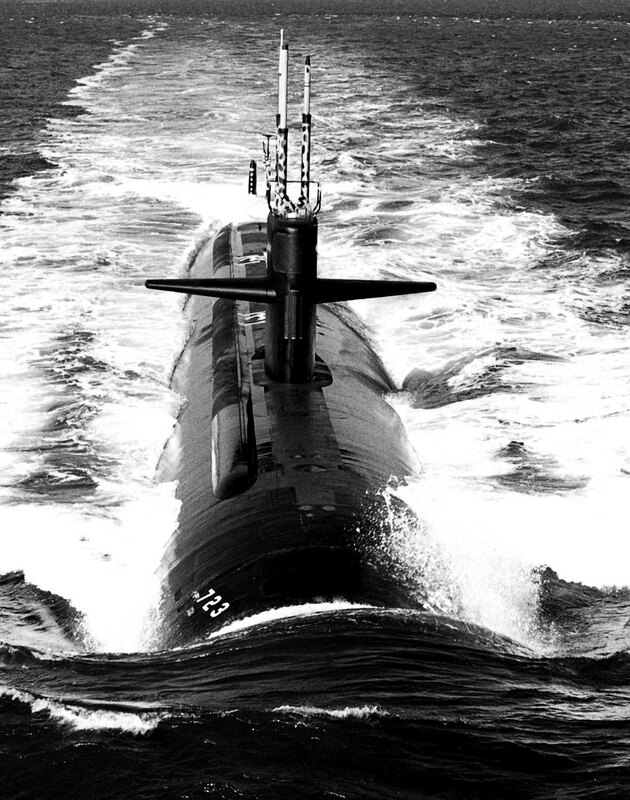 Oklahoma City then commenced operating with Submarine Squadron 15. 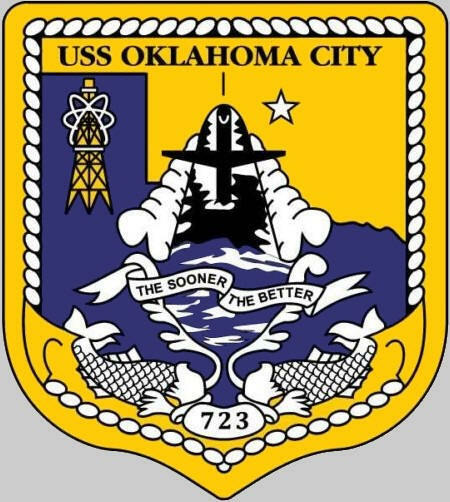 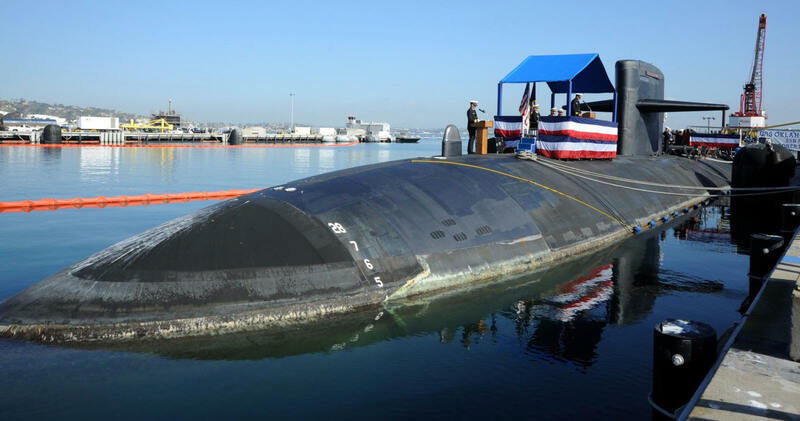 USS Oklahoma City (SSN-723), a Los Angeles-class submarine, is the second ship of the United States Navy to be named for Oklahoma City, Oklahoma. 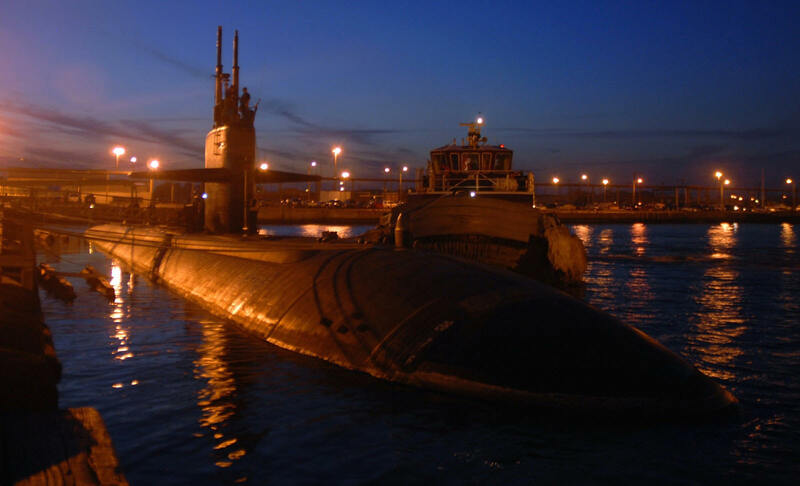 The contract to build it was awarded to Newport News Shipbuilding and Dry Dock Company in Newport News, Virginia on 13 August 1981 and its keel was laid down on 4 January 1984. 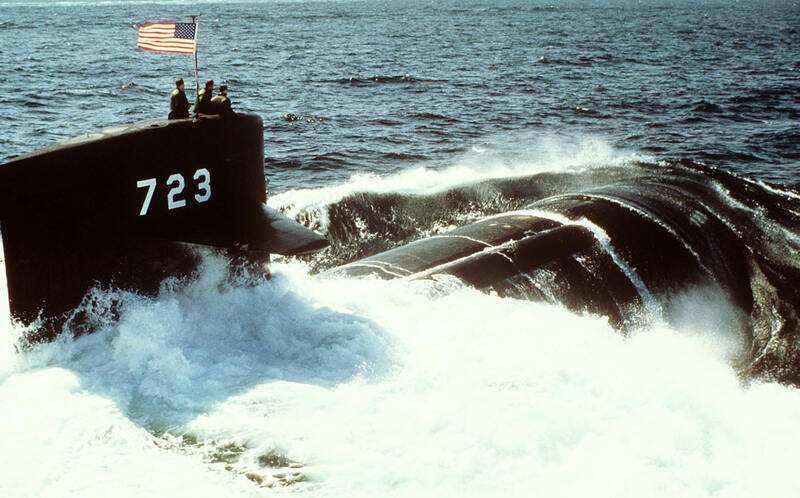 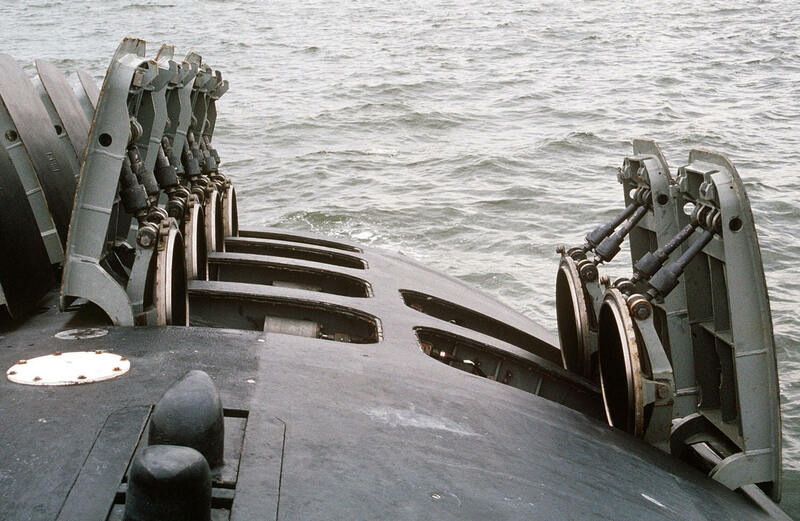 It was launched on 2 November 1985 sponsored by Mrs. Linda M. Nickles, and commissioned on 9 July 1988, with Commander Kevin John Reardon in command. 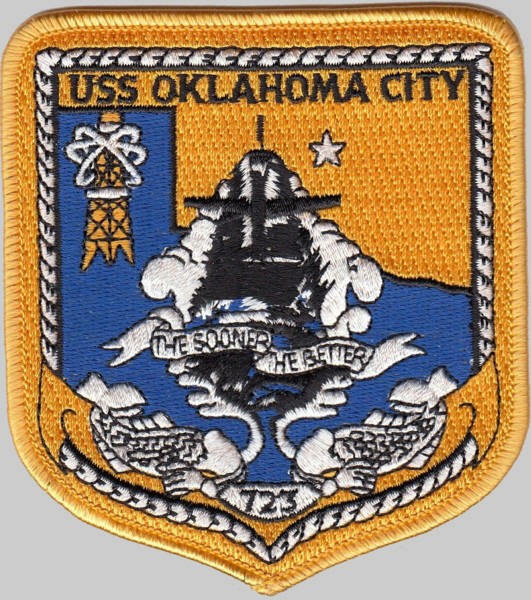 In 1991, Oklahoma City won the Marjorie Sterrett Battleship Fund Award for the Atlantic Fleet. 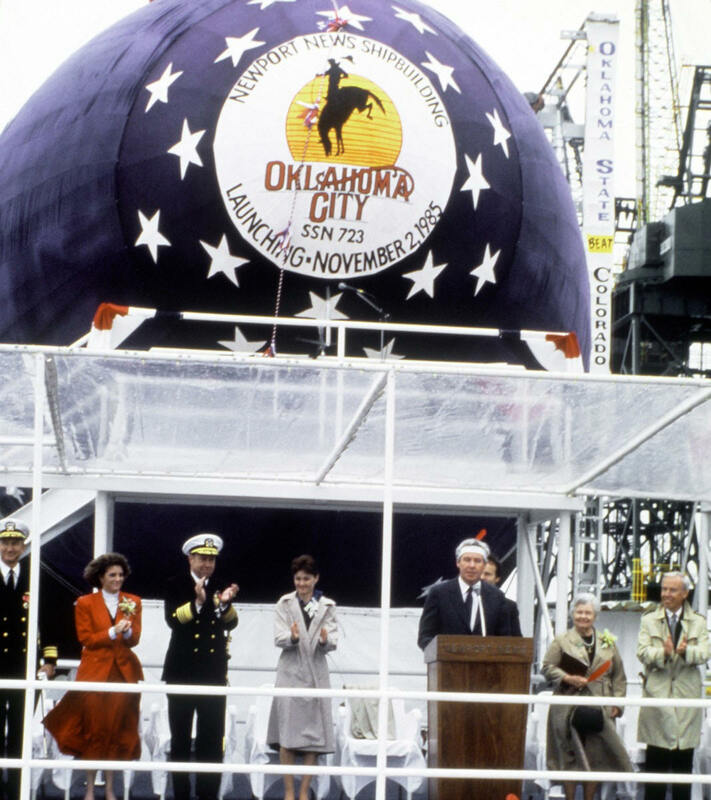 On 13 November 2002, Oklahoma City collided with the Leif Hoegh liquefied natural gas tanker Norman Lady, east of the Strait of Gibraltar. 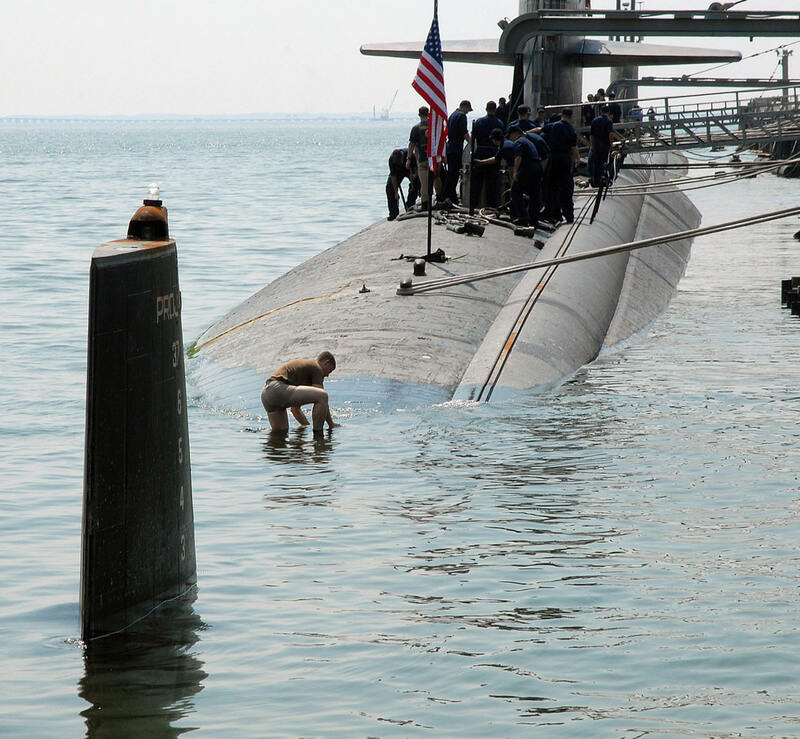 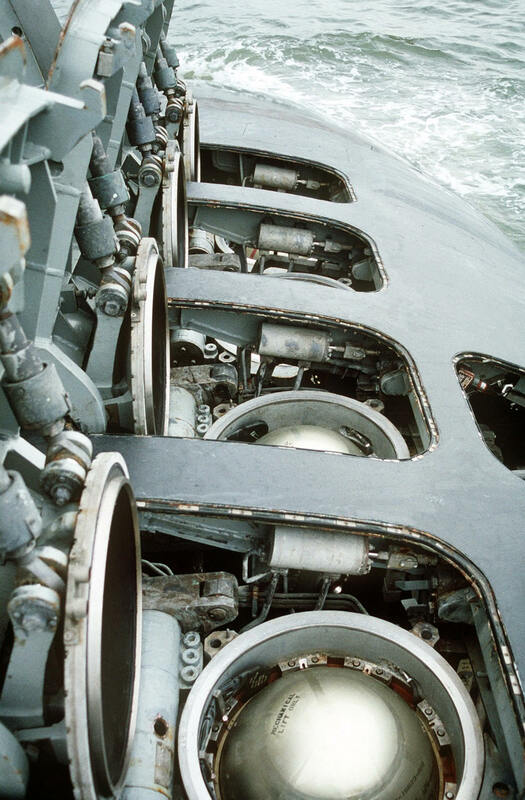 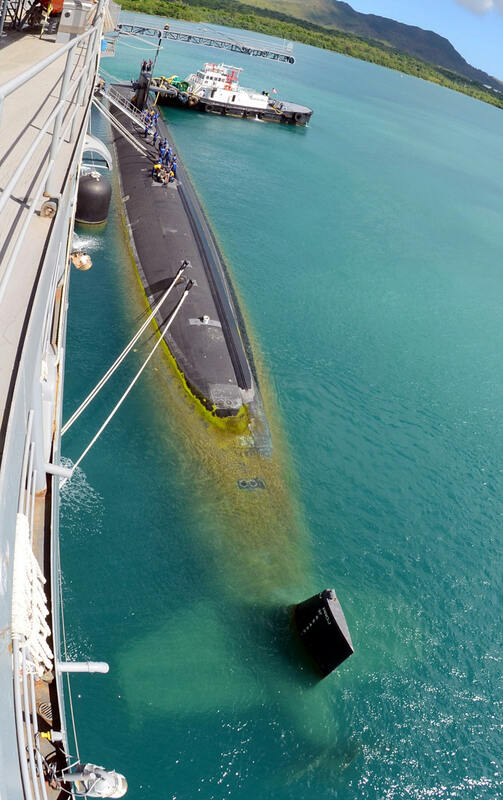 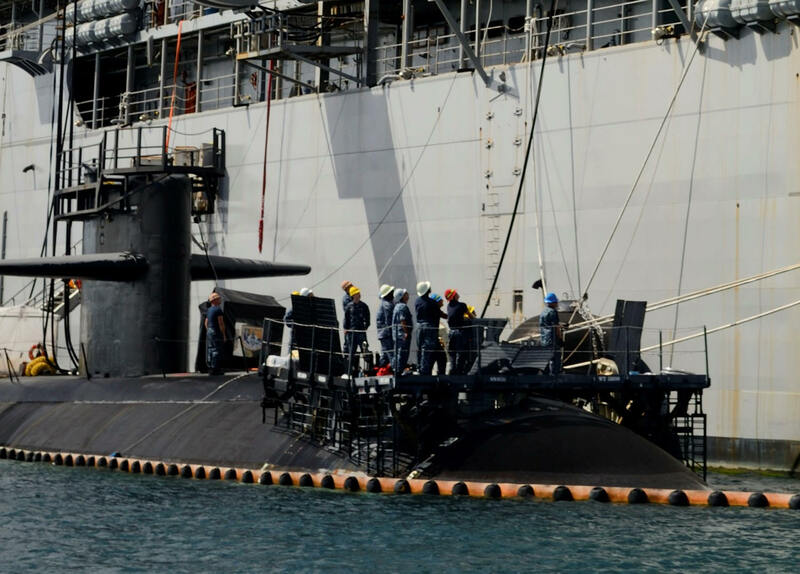 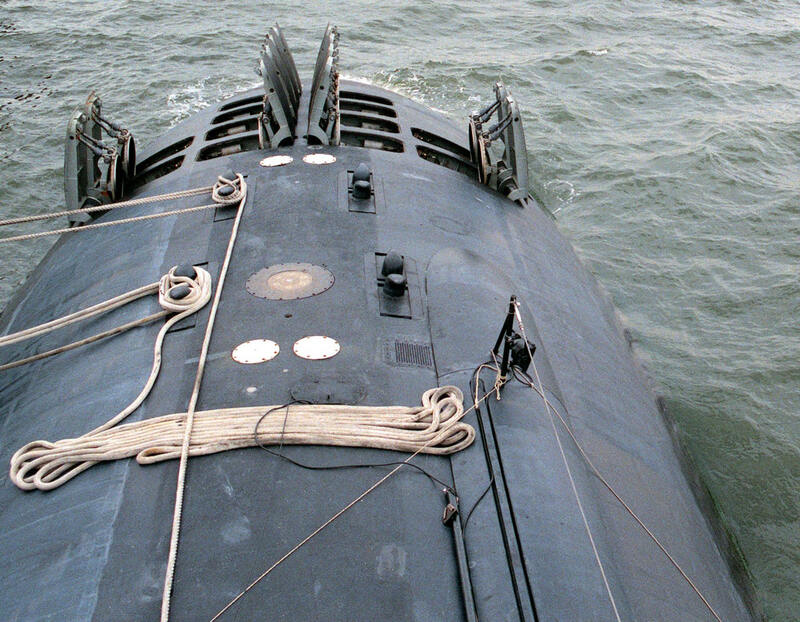 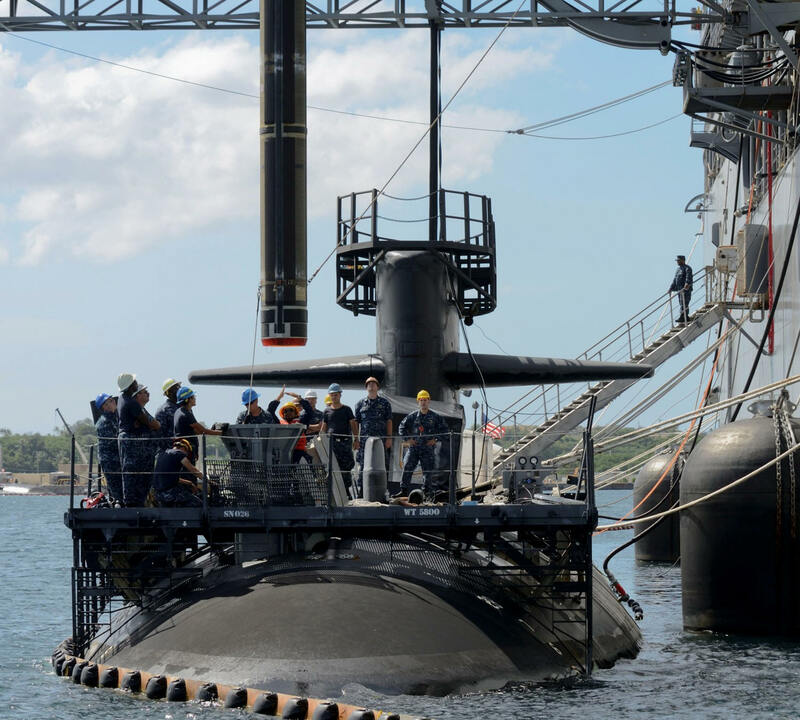 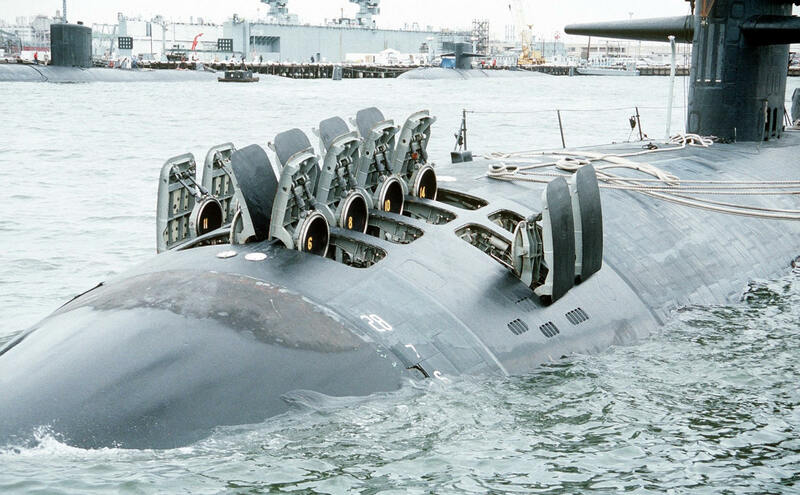 No one on either vessel was hurt, and there were no leaks of oil from fuel tanks and no threat to the environment, but the submarine sustained damage to its periscope and sail area, and put into La Maddalena, Sardinia, for repairs. 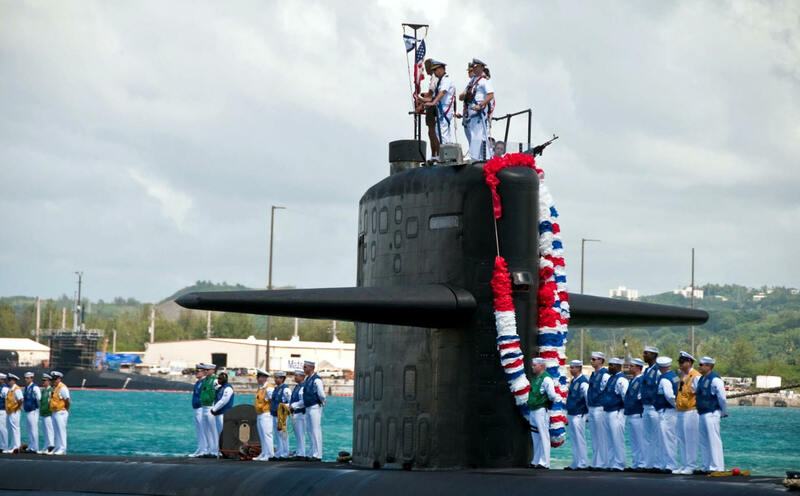 Its commanding officer, Commander Richard Voter, was relieved of his command on 30 November. 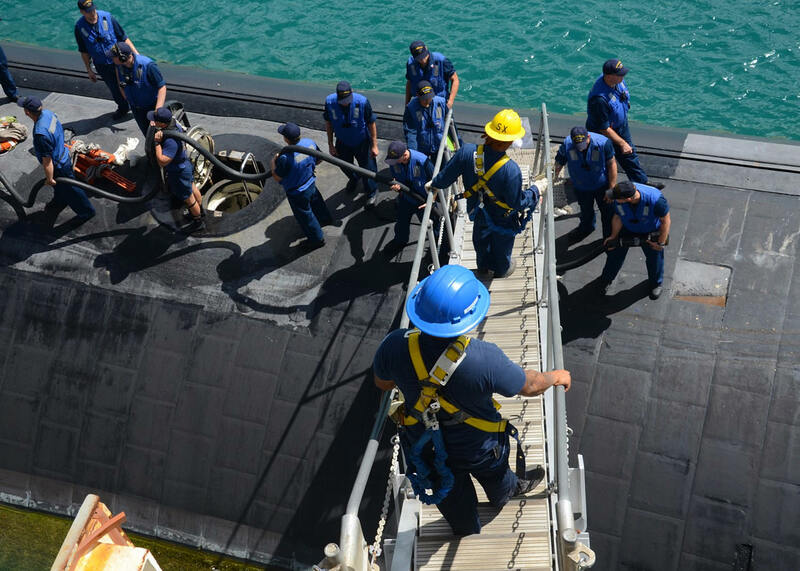 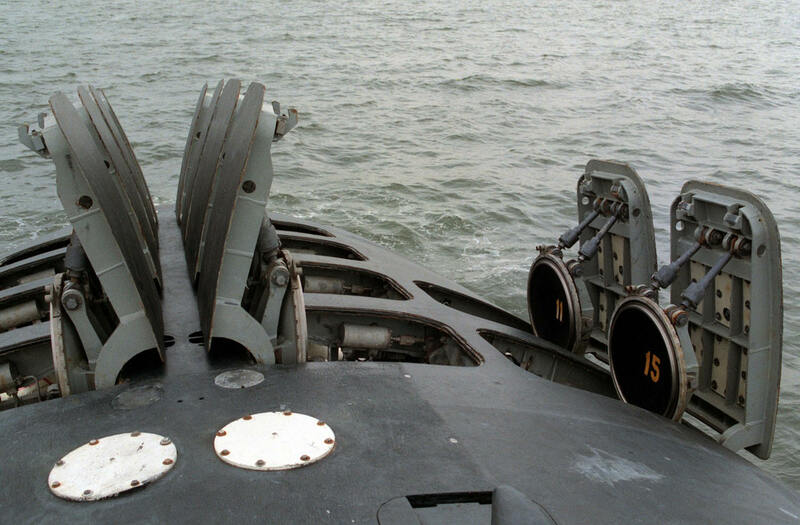 One other officer and two enlisted crew members also were disciplined for dereliction of duty. 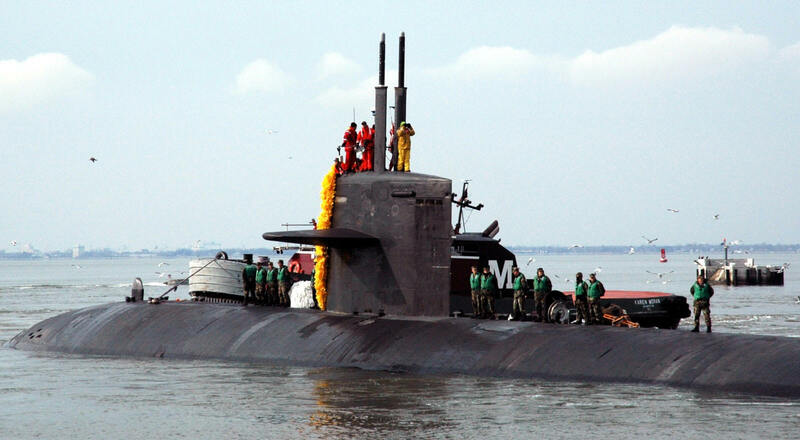 On 20 January 2005 Oklahoma City returned to Norfolk, Virginia, after a six-month deployment in support of national security interests and the War on Terrorism. 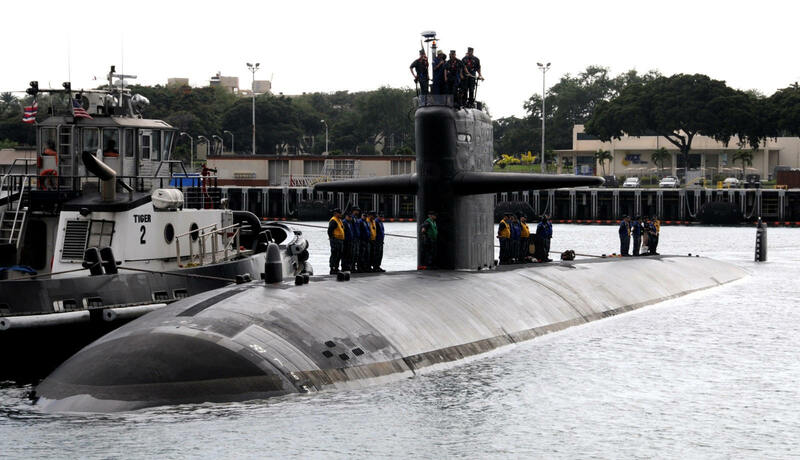 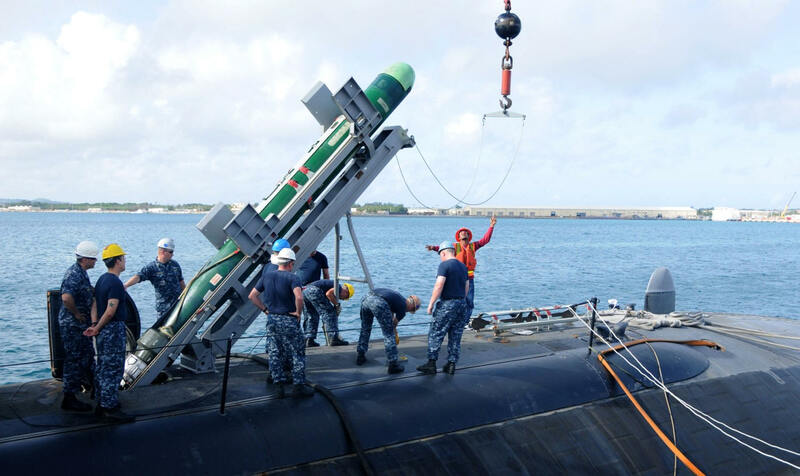 Oklahoma City transited to its patrol area in the Pacific Ocean via the Arctic Ocean, the first such transit for a first-flight Los Angeles-class submarine. 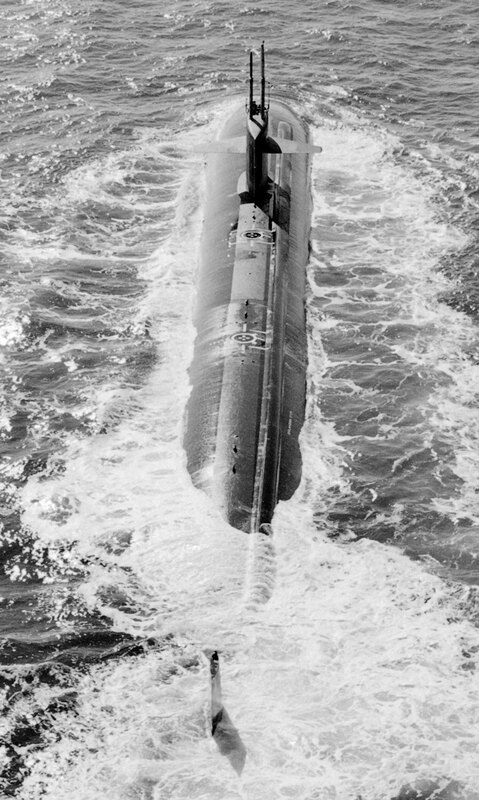 After the patrol, it then completed a circumnavigation of North America by transiting back to the Atlantic Ocean through the Panama Canal and returning to its home port in Norfolk. 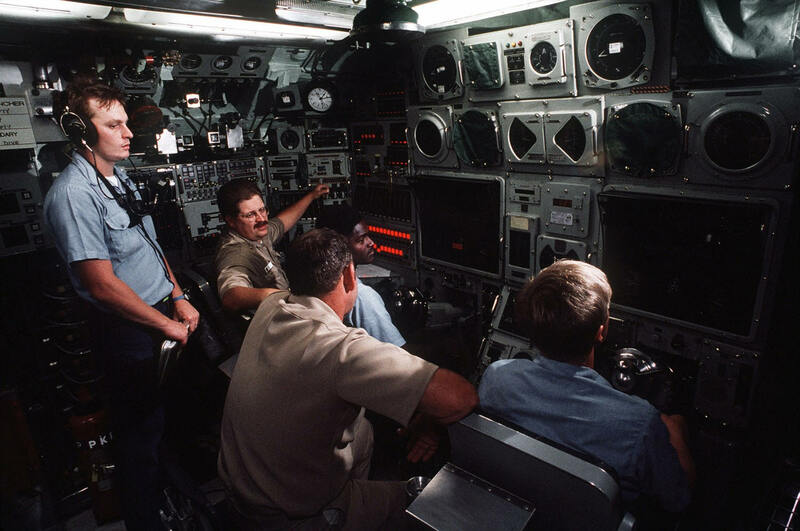 In early 2007, Oklahoma City became the first submarine certified to exclusively use Digital Nautical Charts (DNCs), using the Voyage Management System (VMS). 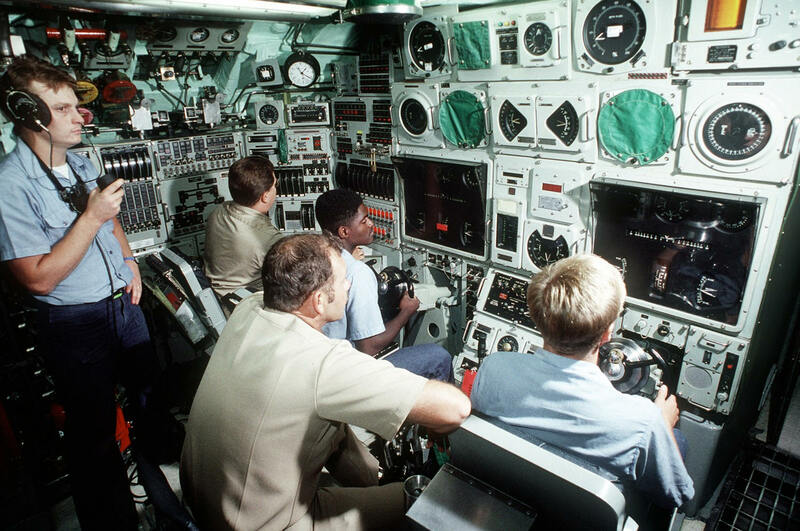 VMS is part of the Electronic Chart Display and Information System-Navy (ECDIS-N) system, which has been under development since 1990. 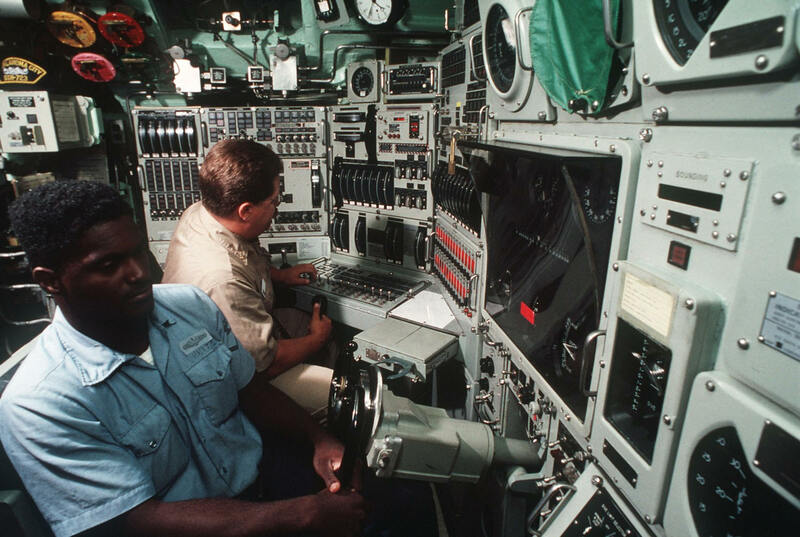 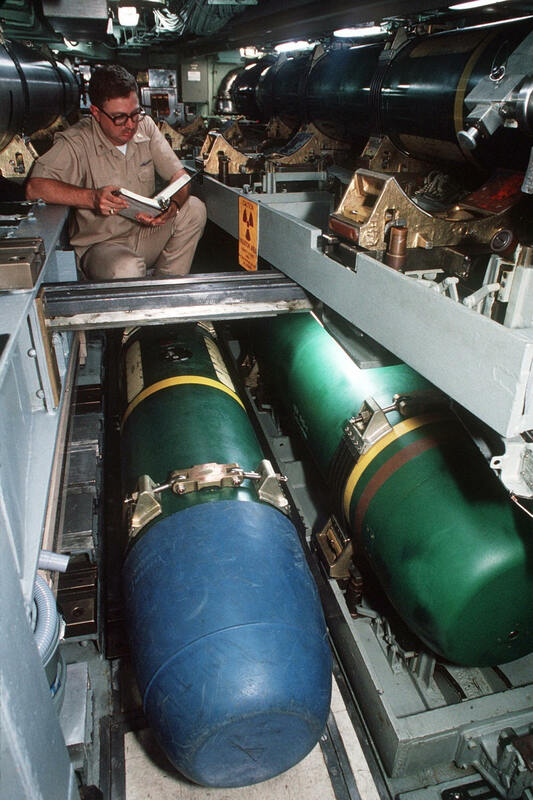 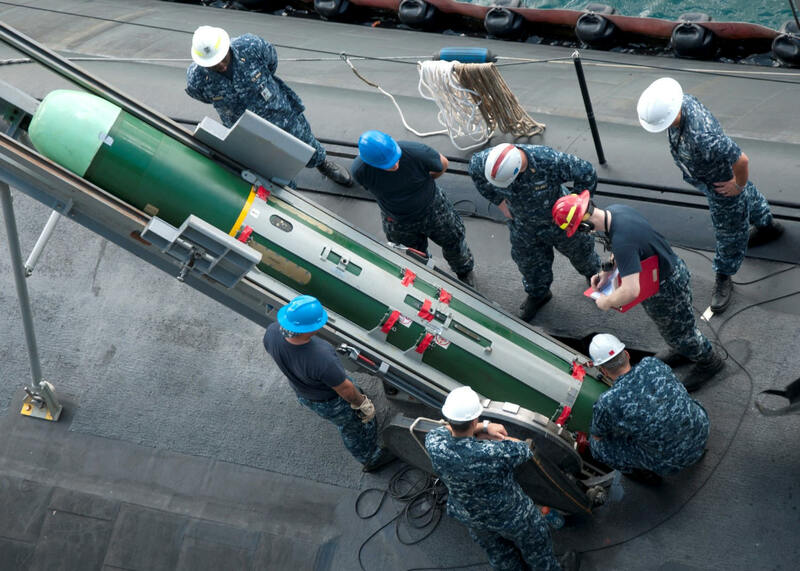 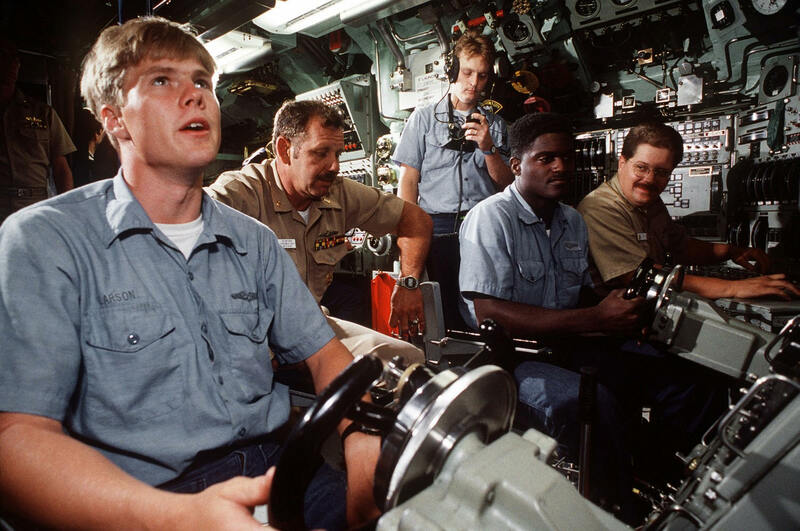 The shift from traditional paper navigation to an all-electronic navigation suite marked the first significant shift in U.S. Navy navigation practices since the introduction of the Global Positioning System (GPS) in the 1990s. 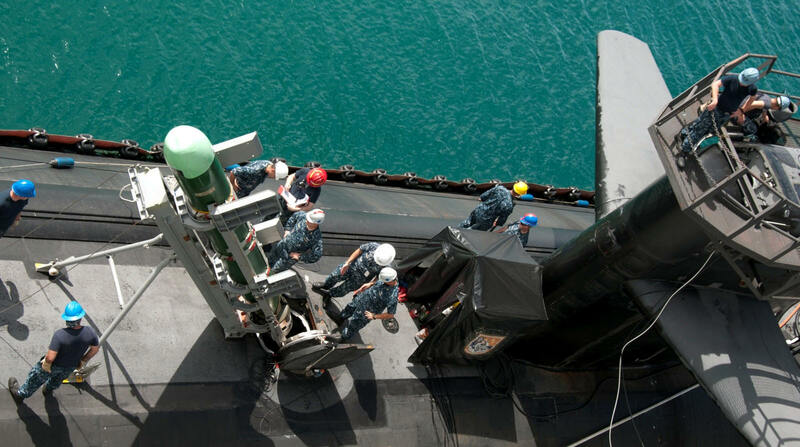 From May to November 2007, Oklahoma City completed a deployment to the Persian Gulf in support of the War on Terror. 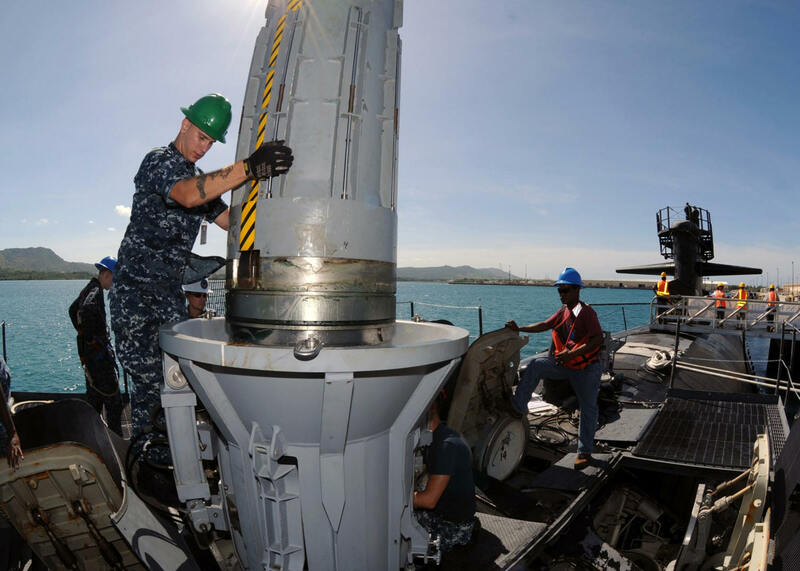 It spent May to July 2008 in the Eastern Pacific in support of the War on Drugs, and was responsible for seizing more than 11 metric tons of cocaine valued at more than $1.5 billion (USD). 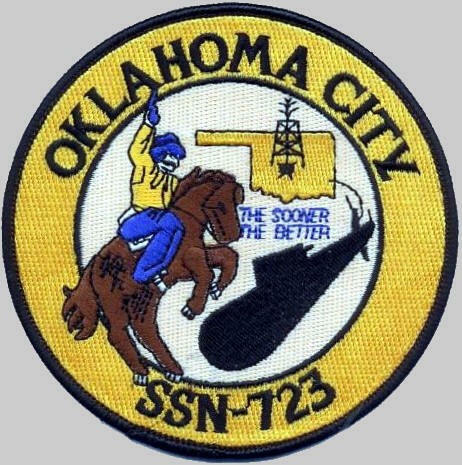 Oklahoma City was awarded the 2008 Squadron Eight Battle "E". 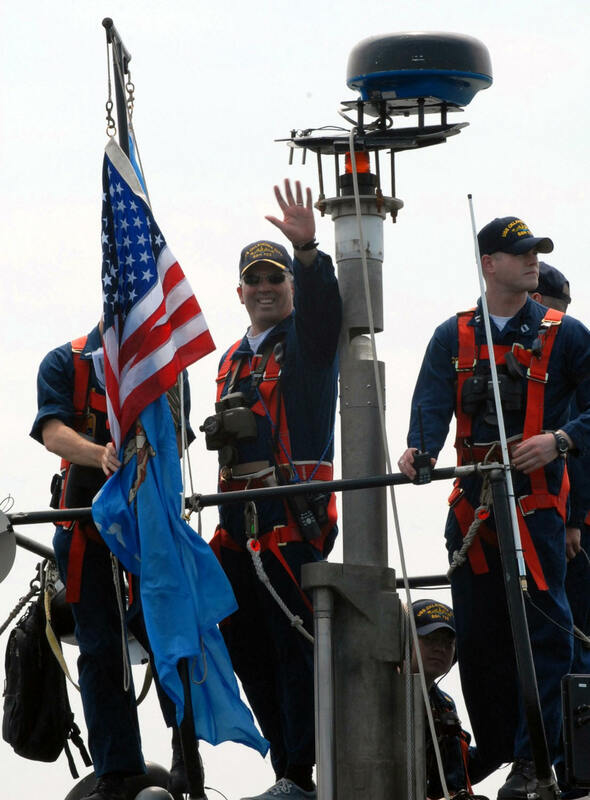 On 22 November 2008, Commander Aaron M. Thieme relieved Commander Louis Edward Mayer IV as Commanding Officer. 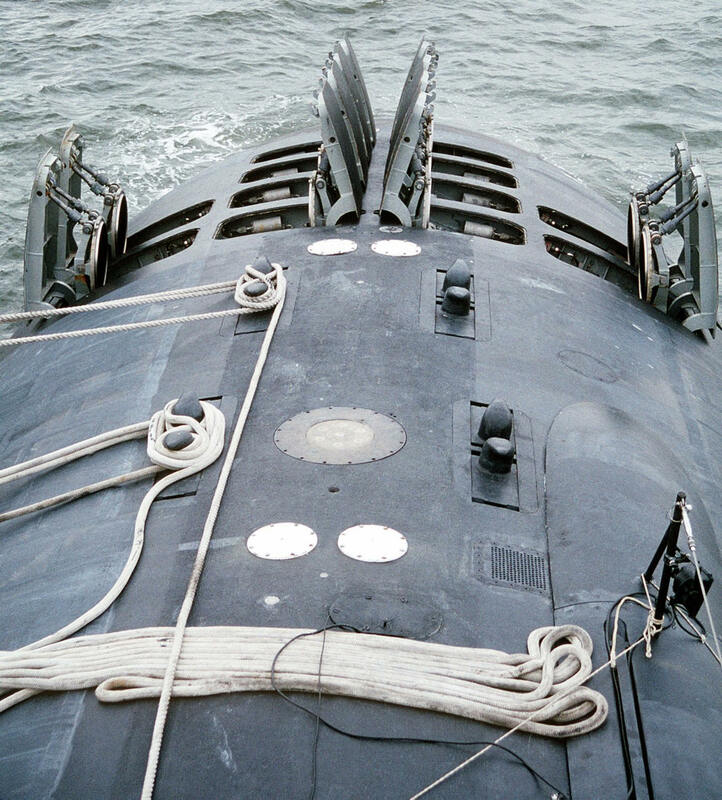 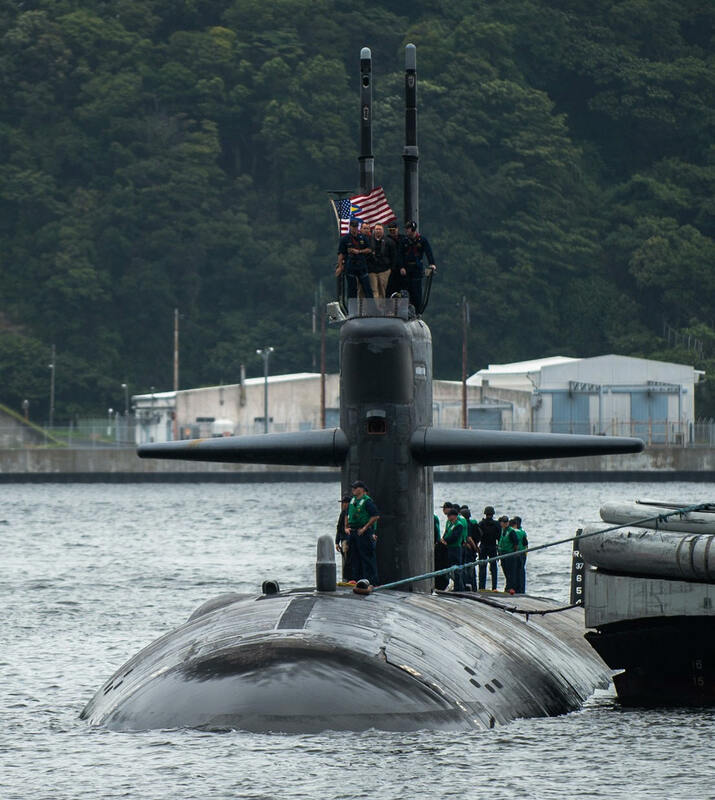 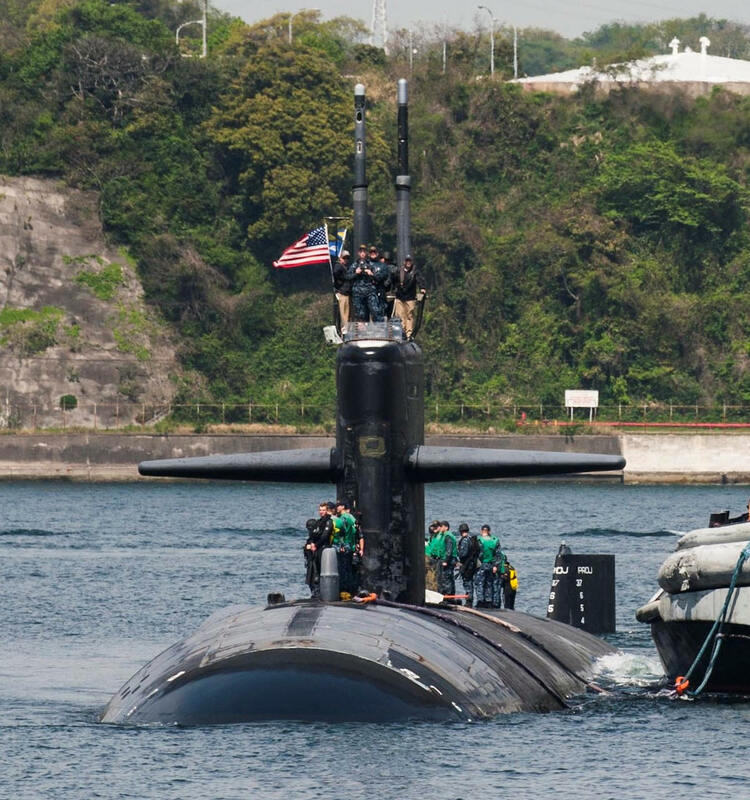 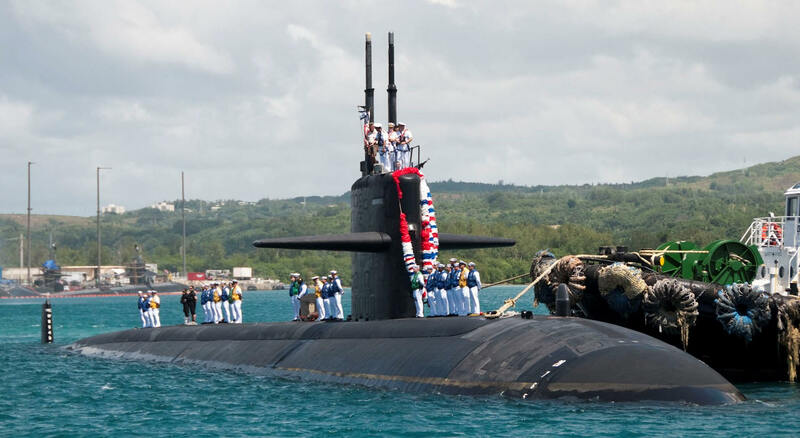 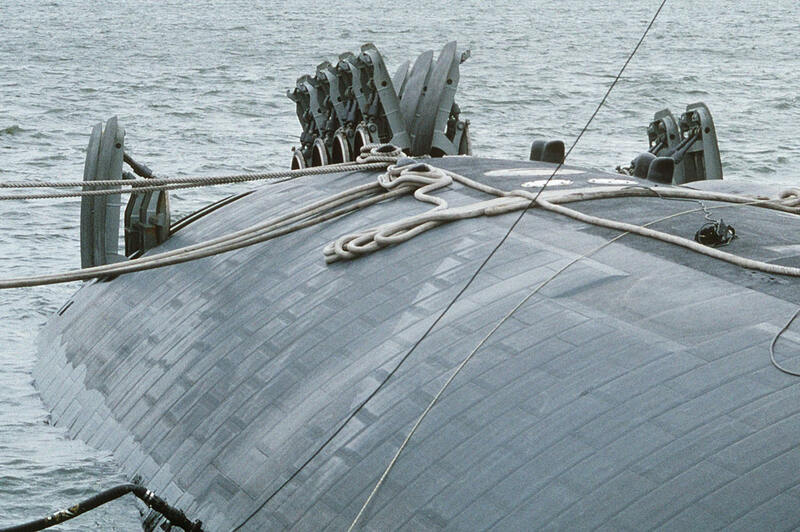 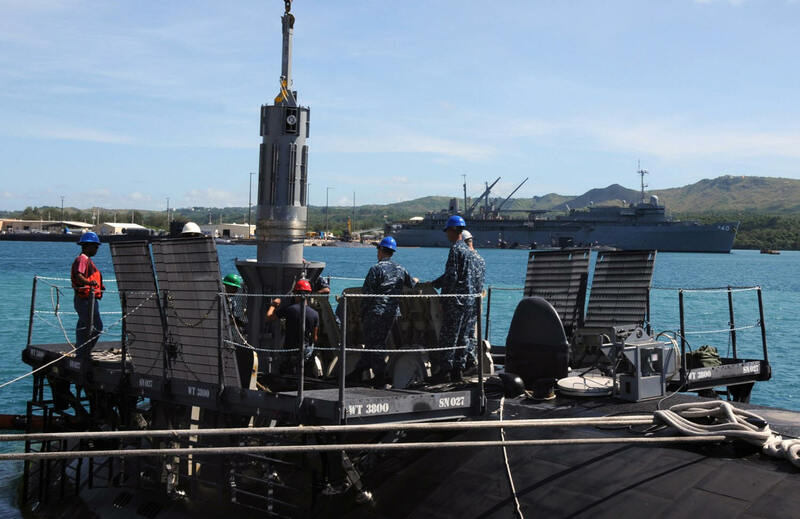 After a 26-month overhaul, in March 2011 the sub was forward deployed to Guam.